Join Team Glendale -See Current Openings! We embrace a Concierge Policing philosophy, rather than only crime response or punishment. If you are the type of person who would rather help identify the source of the problem than be just that reactionary responder, then Glendale Police is the department for you. Applicants hired will be eligible for $10,000 signing bonus. 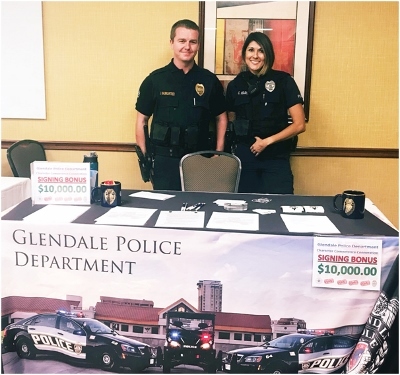 Salary step-increases for laterals are available based on past experience, training, and satisfactory performance through the probationary period of employment with the Glendale Police Department. Once eligible, after completing a shortened FTO/probation, and submitting proof of previous training, we have very clear criteria for the step requirements for all levels of police competency and the salary would start much higher than entry level applicants. Our benefits are bar-none. We offer 10 hour shifts with 3 days off, and provide Employee health insurance through Cofinity, at no cost to the individual. The employee plus spouse is $39.31 per bi-weekly check. Employee with child or children is $35.96 and if the Employee is covering family (Spouse and child/children) it is $62.86 per paycheck. Dental and Vision are included!. We have Flexible Spending Accounts, tuition reimbursement and 9% of officer's annual salary is paid into a 401(a) by the city, with the ability to also invest in a 457 retirement plan. There is even a Complimentary membership for employee and dependent family members to Glendale Sports Center, just to name a few!